Today, Apple will debut a gaming inspired film called “Unleash” that will show non-mobile gamers and heavy users alike what mobile gaming enthusiasts have always known — the iPhone crushes it when it comes to processing power. “Unleash” is an action-packed film that brings to life the ability of the A11 Bionic chip to maintain peak performance during one of the most demanding iPhone activities, mobile gaming. Vainglory Premier League Announced, Further Elevating No. 1 International Mobile Esport. New Partnership with ESP Gaming Will Make Vainglory the Flagship Production Title for Mobile Esports in New Las Vegas Studio. 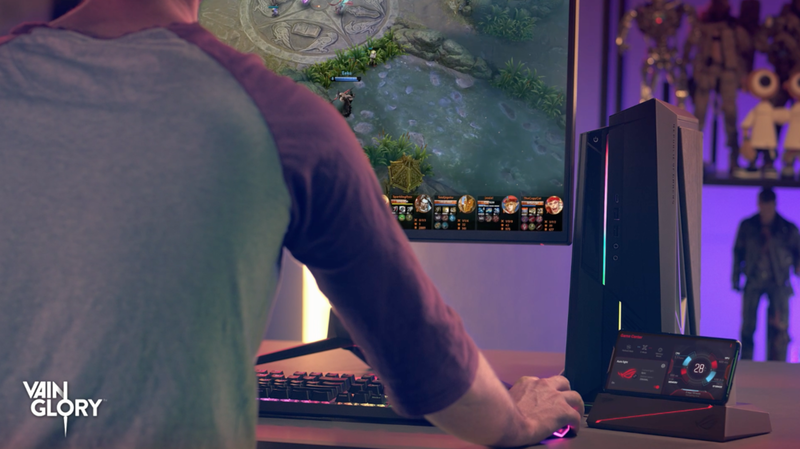 Partnership with Razer Will Combine Vainglory’s Core Gaming Experiences with Razer Phone. We at Super Evil Megacorp are a group of gamers and game industry veterans, on a mission to deliver the very best multiplayer experiences to touchscreens. We believe mobile gamers deserve the same level of strategic depth, graphical quality and control accuracy as other game platforms. We believe it so much that built the company up on our own console-grade game engine, the E.V.I.L engine, to push the performance of handsets to their very limits. In 2014, the E.V.I.L engine and a lot of tireless design work allowed us to unveil Vainglory for the very first time on the Apple stage. Co-founders CaptainNeato and TheRealKrul demonstrated an unapologetically core 3V3 MOBA, featuring 1.2M polygons and 100 fully animated actors, running at 60 FPS with the kind of strategic depth, control accuracy and design polish normally reserved for games on PC or console. Vainglory has since grown to an amazing community of millions of players who play and watch Vainglory every month. The Vainglory community has been invaluable in shaping the direction of the game. Vainglory has also become the largest international mobile esport, with thousands of teams around the world, speaking volumes to the competitive and strategic depth of the game. Still, with 3V3, we knew that our journey was only half done. Our dream was always to bring the fully fledged no-compromises 5V5 MOBA experience to mobile. We didn't just want to do 5V5 - we wanted to do it well - at a level of technical performance, graphical quality, input responsiveness and design sophistication that we ourselves demand as players. We’ve worked hard for years to push the most powerful game engine on mobile even further, and to tirelessly build, test and iterate on art and design concepts. Today, we have something we think is very special to share: What you see below is still alpha. But we know you’ve waited for a long time, and we're finally ready to show what we’re working on. Sovereign's Rise, as the new 5V5 map is called, clocks in at more than 3 million polygons, 200+ fully animated moving actors, rendered at a beautiful 120FPS across compatible devices. With line of sight Fog of War, a new vision game, new objectives, dragons, teleports and deep rotational strategies and more, Vainglory 5V5 has turned out to be an experience we've all fallen in love with. We can't wait to share it with you. Best of all, through tireless optimization of engine and art, Vainglory 5V5 will run on the same devices that currently run 3V3. In practice, iPhone 5 and up and Android 4.1 or more recent handsets with at least a dual-core CPU and 2Gb of memory. Vainglory 5V5 will launch for everyone in February 2018 as part of our 3.0 update. Golden Ticket holders will get 5V5 Early Access in Vainglory's next update, 2.12. Complete quests in-game or pre-register at 5v5.vainglorygame.com for a chance to get your very own Golden Ticket. Vainglory 5V5 is the biggest update ever for Vainglory. We love it, and we hope it just might turn out to be a significant milestone for mobile games as a whole. Because mobile gamers deserve better. See you on the Rise! Razer is the Vainglory World Championship title sponsor and strategic partner! With only a week to go to our World Championships, and barely a week after we unveiled our Coca-Cola partnership we're pleased to announce our mobile esports partnership with Razer, the leading global lifestyle brand for gamers and now also the Vainglory World Championship title sponsor! Super Evil Megacorp and Razer share the same fundamental belief, that gamers are gamers no matter the device they play on, and deserve the best experience that technology has to offer. We’re honored to partner with Razer at a very exciting time, to further advance our mission to bring the best gaming experience possible on mobile devices! Announcing Chromebook support for Vainglory as part of the Google Pixelbook launch! Today we're unveiling Chromebook support for Vainglory as part of the launch of the new Google Pixelbook! Mobile devices are rapidly acquiring the computing performance of modern desktop computers and consoles. At Super Evil, we value great gameplay and great technology. We love that our E.V.I.L. game engine enables us to bring the incredible graphics, deep strategy and tactics of Vainglory to the next generation of gamers - whichever device or input mechanism they choose to play on. You can download and play Vainglory using touch, stylus or mouse + keyboard controls on any Android 7.1.1 or higher Chromebook in beautiful full resolution. Of course for the absolute best Chromebook experience, get it on the Pixelbook. Download Vainglory for Chromebook from the Play Store. Give it a try. Tell us what you think! We’re happy to announce that we've have raised an additional $19 million in funding from our awesome investors. Together, we’re doubling down on our mission to build the best core game experiences for the touchscreen generation. Exciting day with three announcements! Tomorrow we kick off Summer Season 2017 with update 2.6. Four Announcements Ahead of the Vainglory World Championships! But first a look back for a little context. The end of 2016 sees Vainglory in a fantastic position. Following the path forged by gaming on other platforms over the past decade, mobile gaming is in the middle of a shift from short session stand-alone gaming toward deep, shared experiences. Vainglory is at the forefront of that revolution, becoming the standard bearer for an emerging genre. In the past 12 months we’ve more than tripled our active player community on Android. Play on mobile phones in particular has exploded after our phone optimizations. We’re also on course to more than triple our esports views to 450 million minutes watched in 2016. We’re helping build a whole new culture of playing together on mobile. We’re excited about how much faster it is happening than the equivalent culture shift in PC gaming 10+ years ago. And that it’s happening on a massive scale on 3Bn+ touchscreens around the world. At the start of 2016, Vainglory esports was a set of community volunteers organizing tournaments. At the end of 2016, it’s an international multi-tiered network of professional and community tournaments, teams and organizers. Competitive Vainglory is everywhere, from college leagues to amateur tournaments to the top-level Evil Eight competition featuring multi-esports organizations such as TSM, Cloud9, G2 Esports, Mousesports, SK Gaming, Team Secret and more. For signs of the exceptional health of Vainglory’s esports scene, look no further than Team SoloMid. The successful professional team won both the 2016 Winter Live Championship and the 2016 Summer Live Championship. Now, this trio of full-time pro players has moved into a Las Vegas team house where they can further expand their regimen beyond their 8-10 hour/day practice schedule. Living and playing together allows them to maintain the “bootcamp” atmosphere that has been so successful for them in past domestic and international competitions. Their parents have been “remarkably supportive,” according to team captain FlashX, and this level of commitment — sure to be soon replicated by other top-flight organizations — shows how far the Vainglory professional scene has come in a remarkably short period of time. Moving into 2017, we’re excited to announce the next big step in our esports program: our Franchise Program for professional teams. The program deepens our partnership with the professional team and player community to build a healthy, growing competitive ecosystem. We’re looking to share the esports revenue they help to create as well as assist in digital and physical merchandise sales. Franchise holders will not automatically earn a spot in the top competition. They still need to qualify and perform like everyone else. But we expect the close collaboration to help level up esports across the board. The first eight franchise holders and more details will be announced in early 2017 ahead of the start of Spring season. Compared to a year ago, Vainglory is almost unrecognizable. Update 2.0 makes milestone improvements to Vainglory’s out-of-game, social and competitive experiences — addressing players’ most-requested features and adding new dimensions to the gameplay itself. Update 2.0 introduces a revised hero overview screen and new education tools on roles and responsibilities in the game to help teach the game to new players. For veterans, there are multiple new items and revamped jungle objectives designed to further expand tactical choice and diversity, while deliberately creating more opportunities for epic comebacks from teams that falter early in a match. New guild discovery and administration tools are expected to dramatically increase Vainglory’s social guild participation, helping friends play together all over the world. To help players collect all skins and heroes more easily, we’re launching a brand new Mystery Chest containing literally everything a player could want, with a better than 1-in-3 chance of unlocking a random hero or skin from Vainglory’s entire content catalog. All this comes in one update, following a 2016 year where Vainglory added a deep tutorial, quests, practice vs bots, casual play modes, progression systems, direct-from-device video streaming, replays, doubled its hero roster and more. As we grow, we are evolving some team roles. Moving into 2017, founding CEO Bo “Nansen” Daly will take on a new post as President and Chief Business Officer, and current COO Kristian “EdTheShred” Segerstrale will step in as CEO. These shifts are designed to help the company deepen its partnerships around the world, as well as help the company grow faster across the board. Nansen remains a Koshka main and EdTheShred still struggles to hold onto his PoA status as a Roam main. As ever, thanks to all our players for their support during an incredible year — and make sure you tune into the World Championship this weekend on http://twitch.tv/vainglory. And remember to check out the Update 2.0 releasing December 14, then teach your friends and family to play over the holidays. There’s never been a more exciting time to enter the Fold! Welcome to Autumn Season 2016 - the Season for Playing Together! We're excited to announce the venues for the Summer Season Championship live events! Tickets are on sale now for the North American and European Championships, to be held in September. Read the press release with full details below and get your tickets now!